Today we have Actinium Pharmaceuticals, Inc. (ATNM) on our radar. The company is trading on the NYSE American and is currently priced at 0.43. The global cancer therapy market has forecasted extensive growth due to higher prevalence and incidence of Cancer Worldwide. The US market is estimated to account for 46% of the global cancer cost. The first targeted cancer therapy was tamoxifen approved in the 1970s. Targeted cancer therapies are drugs that are actively involved in blocking the growth of cancer by interfering with specific molecules which are responsible for the growth, progression, and spread of cancerous cells. These therapies are also known as precision medicines. Targeted cancer therapy is different from standard chemotherapy treatment as these therapies target only cancerous cells without affecting the normal cells. Also targeted cancer therapy block tumor cell proliferation, whereas standard chemotherapy kills the tumor cells. One NYSE Company is making great strides working on developing targeted therapies for patients with cancers who are lacking effective treatment options. Early results are promising and both Wall Street and Cancer Patients are waiting to hear positive results. In the meantime, this stock has been beaten up recently, and may very well be one to add to the watchlist. Cancer cells. Their targeted therapies have demonstrated the potential to result in significantly improved access to bone marrow transplant with better outcomes, namely increased marrow engraftment and survival. ATNM‘s proprietary technology platform utilizes monoclonal antibodies to deliver radioisotopes directly to cells of interest in order to kill those cells both safely and effectively. Actinium is currently progressing three drug candidates in clinical trials. ATNM‘s lead product candidate, Iomab-B, is licensed from the Fred Hutchinson Cancer Research Center and is designed to be used, upon approval, in preparing patients for a hematopoietic stem cell transplant, commonly referred to as bone marrow transplant. A bone marrow transplant is often the only potential cure for patients with blood-borne cancers, but the current standard preparation for a transplant requires chemotherapy and/or total body irradiation that result in significant toxicities. Iomab-b is currently in Phase 3 and is showing tremendous progress. 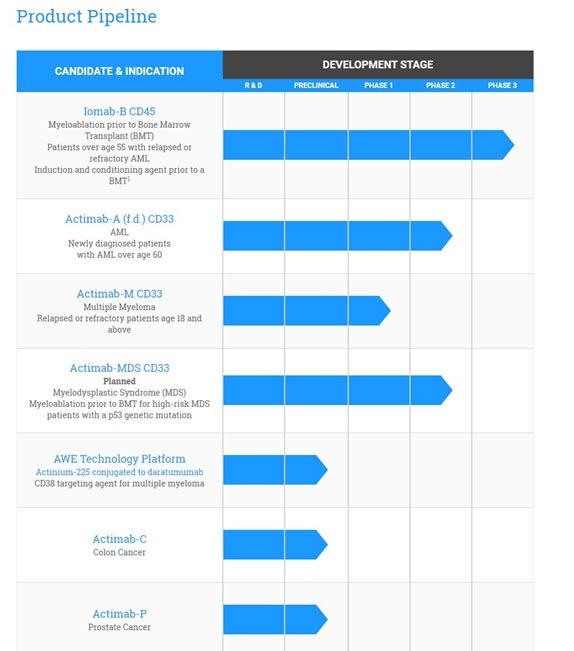 ATNM recently announced the successful activation of 16 clinical trial sites in the Phase 3 study. With Stony Brook, New York-based Stony Book University, the sixteen clinical trial sites in the Phase 3 SIERRA trial represent over one-third of bone marrow transplant volume in the U.S., which bodes well for reaching the 150-patient enrollment goal. Upon approval, Iomab-B is intended to prepare and condition patients for a bone marrow transplant also referred to as a hematopoietic stem cell transplant, which is often considered the only potential cure for patients with certain blood-borne cancers and blood disorders. It has shown progress treating a number of blood cancer indications, including acute myeloid leukemia (AML), chronic myeloid leukemia (CML), acute lymphoblastic leukemia (ALL), chronic lymphocytic leukemia (CLL), Hodgkin’s disease (HD), Non-Hodgkin lymphomas (NHL) and multiple myeloma (MM). Iomab-B has been granted Orphan Drug Designation for relapsed or refractory AML in patients 55 and above by the U.S. Food and Drug Administration and the European Medicines Agency. The Bone Marrow and Transplant Market is projected to expand at a steady CAGR of 3.9% over forecast period 2015–2021 and is expected to be valued at US$10.3 Billion by the end of 2021. Among other markets globally, the market in Europe is expected to remain dominant in terms of value and volume throughout the forecast period. ATNM is also developing Actimab-A, its lead alpha-particle drug candidate. Actimab-A is currently in a multicenter open-label, 53-patient Phase 2 trial for patients newly diagnosed with AML age 60 and over. Actimab-A is being developed to induce remissions in elderly patients with AML who lack effective treatment options and often cannot tolerate the toxicities of standard frontline therapies. Last but not least, ATNM has also has expanded its alpha-particle approach to include newly created drug candidate Actimab-M, which is being studied in patients with relapsed or refractory multiple myeloma in a Phase 1 clinical trial. Announced Actimab-MDS, a new clinical initiative focused on improving transplant outcomes as measured by 1-year overall survival for patients with high-risk myelodysplastic syndrome with a p53 genetic mutation. We intend to begin a Phase 2 trial with Actimab-MDS that will be led by principal investigator Dr. Gail Roboz of Weill-Cornell and the MDS Clinical Research Consortium that is comprised of the Cleveland Clinic, Dana-Farber Cancer Institute, Johns Hopkins, MD Andersen Cancer Center, Moffitt Cancer Center. Presented Phase 2 data at ASH from our Actimab-A clinical trial showing a 69% overall response rate in patients with AML who are older and unfit for induction chemotherapy. Actimab-A produced these results as a single agent that is administered via two infusions on day 1 and day 8. Launched the AWE Program that is focused on creating ARCs or antibody radio-conjugates or biobetters utilizing actinium-225 in partnership or collaboration with biopharmaceutical companies. Presented preliminary preclinical data from our AWE Program at ASH where we showed an up to ten-fold increase in the cell-killing ability of daratumumab, a blockbuster CD38 antibody therapy for patients with multiple myeloma that is marketed by Johnson & Johnson. An abstract was published in the ASH volume of blood®confirming the expression of CD33 in patients with multiple myeloma from a large U.S. patient database, providing further validation for our Actimab-M clinical trial in refractory multiple myeloma patients, which is the first CD33 targeted therapy for this patient population. Announced that the independent data monitoring committee reviewed initial data from the first 20 patients in the pivotal Phase 3 SIERRA trial for Iomab-B and recommended that the trial continue as planned. The Company reiterates its intent to build upon the promise of both the CD45 and CD33 programs over the next three to five years by gaining approval and commercializing multiple product candidates based on these programs to enhance access to bone marrow transplant with improved outcomes via its improved myeloablation approach and to partner strategically to enhance the value of its programs and technology platforms. If you are still reading this, then you see the value that ATNM has to offer. Positive Phase 3 announcements have been known to launch biotechs into the stratosphere. Results are due shortly, and this is one company worth watching very closely. For now, it is worth adding ATNM to the watchlist and carefully observing for an ideal entry. DISCLAIMER: By Section 17(b) of the Securities Act of 1933, you are at this moment advised that SGN Media Group, Inc. has received a fee of one thousand and five hundred dollars in monies from Sunrise Media, LLC for distribution of this email and other advertising services. We have been engaged by a third person (not the issuer); accordingly, you should assume that such third person who engaged us in connection with this profile owns shares of the company AND may sell such shares in the public market. The sale of such shares may negatively impact the market price of the shares for the profiled company. We have not determined if the statements and opinions of the message are accurate, correct or truthful; nor are they confirmed. The profiles we publish are compiled from publicly available information, which includes, but are not limited to, no cost online research, magazines, newspapers, reports filed with the SEC or information furnished to OTC Markets, and press releases. Emails received by you are not a solicitation or recommendation to purchase or sell securities of the advertised company. Such recommendations may only be made pursuant to applicable laws. Emails from us are not disclosure documents. If you are considering purchasing any securities of an advertised company, you should read and review, if and to the extent available, any information concerning a marketed company available at the websites of the U.S. Securities and Exchange Commission (the “SEC”) at www.sec.gov ; the Financial Industry Regulatory Authority (the “FINRA”) at www.FINRA.org and your State Securities Administrator. We also strongly recommend that you read the SEC advisory to investors concerning Internet Stock Fraud at www.sec.gov/consumer/cyberfr.htm, as well as related information published by the FINRA on how to invest carefully. You are responsible for verifying all claims and conducting your due diligence. You agree and acknowledge that any hyperlinks to other websites or other information contained in our emails are provided only for your reference and convenience. We are not responsible for the accuracy or reliability of these external sites, nor are we responsible for the content, opinions, products or other materials on external sites or information sources. If you use, act upon or make decisions in reliance on information contained in any disseminated email or any hyperlink, you do so at your own risk and agree to hold us, our officers, directors, shareholders, affiliates, and agents harmless. You acknowledge that you are not relying on us, and we are not liable for, any actions taken by you based on any information contained in any disseminated email or hyperlink. You also acknowledge that we are not an investment advisory service, a broker-dealer or an investment adviser. You acknowledge that you will consult with your advisors regarding any decisions as to any company mentioned here. 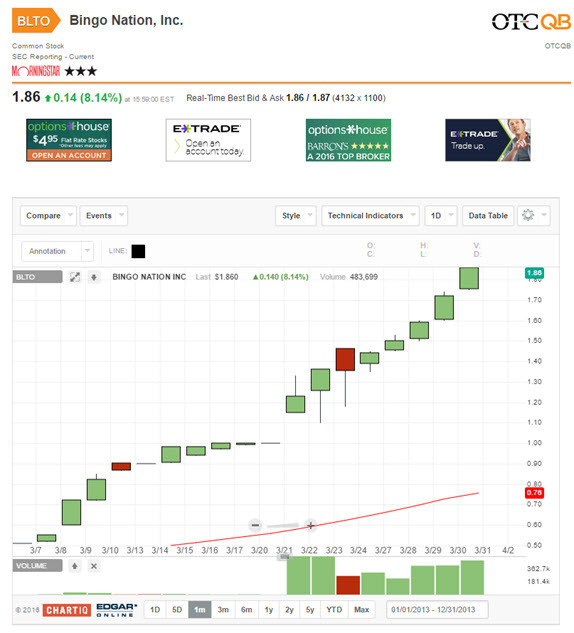 We are happy to have NGTF on our radar once again if you remember the last time we featured Nightfood Hldgs Inc, the day of and in the days to come, you saw NGTF chart rise and gains of nearly twenty cents. We are always optimistic when we get to feature a past winner, and as you know there is no promise that history will repeat itself, and nevertheless, we are happy to present to you again NGTF and update you on their recent events. Be sure to keep them on our radar in the days to come I know I will. More to Snack on: The Total US snack market is approximately $120 billion, and 44% of that occurs in the evening or late night, representing a total consumer spend of over $1 billion weekly on night time snacks. The snack food industry has been steadily growing over the years and continues to outpace total food and beverage trends. Snacking dynamics continue to change. Consumer choices for size and channel have evolved, innovation has become more targeted, and variety and children are having an impact on snacking choices. Has Nightfood Hldgs Inc, come up with a potential solution? TARRYTOWN, NY–(Marketwired – Aug 17, 2017) – NightFood Holdings, Inc. (OTCQB: NGTF), a fully reporting “better-for-you” snack company, today announced that gluten-free versions of NightFood products are currently being developed. The Company expects the initial manufacturing run of gluten-free NightFood bars to occur sometime during the fourth quarter of calendar 2017 in both current popular flavors (Cookies n’ Dreams and Midnight Chocolate Crunch). In addition, the Company has plans to introduce two new flavors to the marketplace, also before the end of 2017. NGTF is a snack food company dedicated to providing consumers delicious, better-for-you choices for evening snacking. NGTF is tackling a big consumer problem. Well over 70% of adults under 18-54 snack between dinner and bed. The most popular choices are cookies, chips, ice cream, and candy. These popular nighttime snack choices are not only unhealthy but contain ingredients that can be disruptive to sleep quality. NGTF provides consumers with better nighttime snack options, launching a line of products that satisfy nighttime cravings in a better, more sleep-friendly way. NGTF is confident they can build on the successful online pilot programs which established a direct to consumer online marketing presence. NGTF can operate profitably as a stand-alone in the short term while providing support for the expansion of existing retail distribution. This allows for faster revenue growth than focusing solely on traditional retail channels. NGTF learned from Facebook data that the NightFood Brand resonates with the consumer. NGTF intends to drive revenue growth while developing relationships directly with customers through its online presence. This can be beneficial in many ways, including when testing and introducing innovations, flavors, and snack formats. Please do your due-diligence at: www.nightfood.com and be sure to keep NGTF on your radar. DISCLAIMER: By Section 17(b) of the Securities Act of 1933, you are hereby advised that SGN Media Group, Inc. is receiving a fee of three thousand five hundred dollars in monies for a one-day period, from Nightfood Hldgs Inc., a publicly traded company, for distribution of this email, and other advertising and consulting services. We have not determined if the statements and opinions of the message are accurate, correct or truthful. The profiles we publish are compiled from publicly available information, which includes, but are not limited to, no cost online research, magazines, newspapers, reports filed with the SEC or information furnished to OTC Markets, and press releases. Because virtually all information relied upon by us in preparing an Issuer profile comes from a public source that has been made public directly from the Issuer, the information is not confirmed by a second source. Emails received by you are not a solicitation or recommendation to acquire securities of the advertised company. An offer to buy or sell securities can be made only by a disclosure document that complies with applicable securities laws and only in the States or other jurisdictions in which the securities are eligible for sale. Emails distributed through disseminated emails are not disclosure documents. If you are considering purchasing any securities of an advertised company, you should read and review, if and to the extent available, any information concerning a marketed company available at the websites of the U.S. Securities and Exchange Commission (the “SEC”) at www.sec.gov; the Financial Industry Regulatory Authority (the “FINRA”) at www.FINRA.org and your State Securities Administrator. We also strongly recommend that you read the SEC advisory to investors concerning Internet Stock Fraud at www.sec.gov/consumer/cyberfr.htm, as well as related information published by the FINRA on how to invest carefully. You are responsible for verifying all claims and conducting your due diligence. You agree and acknowledge that any hyperlinks to the website of (1) a client company, (2) the person issuing or preparing the information for the company, or (3) other information contained in our disseminated emails is provided only for your reference and convenience. We are not responsible for the accuracy or reliability of these external sites, nor are we responsible for the content, opinions, products or other materials on external sites or information sources. If you use, act upon or make decisions in reliance on information contained in any disseminated email or any hyperlink, you do so at your own risk and agree to hold us, our officers, directors, shareholders, affiliates, and agents harmless. You acknowledge that you are not relying on us, and we are not liable for, any actions taken by you based on any information contained in any disseminated email or hyperlink. You also acknowledge that we are not an investment advisory service, a broker-dealer or an investment adviser. You acknowledge that you will consult with your advisors regarding any decisions as to any company mentioned here. Please note previous compensation: November 2016, one thousand dollars in monies from Mantle Media LLC for distribution for the email distribution and other advertising services which occurred in 2016. May 2017, six thousand five hundred dollars in monies from Mantle Media, LLC for distribution of email, other advertising, and consulting services which occurred in May of 2016. 2017 WallStreetProfiler(dot)com All rights reserved. BEVERLY HILLS, CA — (Marketwired) — 06/28/17 — Reign Sapphire Corp. (OTCQB: RGNP) (“Reign” or the “Company”), a direct-to-consumer, branded and custom jewelry company, today announced its launch of a division that focuses exclusively on delivering its unique custom jewelry to the corporate and business gift market segment. The new division was created in response to growing demand from corporate clients such as Hawaiian Airlines with its Breast Cancer Awareness campaign and a Super Bowl featured National Football League (NFL) team. The personalized gifts segment is part of the corporate and business recognition market, a field increasingly dependent on technology enabled customization and one in which Reign maintains a competitive edge. Entry into the segment provides an opportunity to boost higher margin sales due to the minimum order quantity and the less work required to customize batch orders. One corporate order can result in hundreds of new Reign retail customers who will be introduced to Reign’s niche custom brands through the gifts received from their corporate partner. Reign Sapphire (OTCQB: RGNP) is a Beverly Hills-based, D2C branded and custom jewelry company with three niche brands: Reign Sapphires: ethically produced, millennial targeted sapphire jewelry, Coordinates Collection: custom jewelry, inscribed with location coordinates commemorating life’s special moments, and Le Bloc: classic customized jewelry. http://www.reignsc.com. As anticipated we are seeing some profit-taking across the board in large cap stocks. This occurs at the end of every fiscal quarter as hedge funds and money managers want to pull out some profits and wait for their bonuses. Turns out, this is a bonus for us too as some of those profits are geared towards small caps and microcaps. Historically we see some money flow in our direction. With that in mind, we want to bring to your attention a company which we recently covered and may be that sparkling gem in your portfolio. Reign Sapphire (OTCQB: RGNP) is a Beverly Hills-based, direct-to-consumer, branded and custom jewel(ry company with 3 niche brands: Reign Sapphire: ethically produced, direct mine-to-consumer sapphire jewelry targeting millennials, Coordinates Collection: custom jewel(ry, inscribed with location coordinates commemorating life’s special moments, and Le Bloc: classic customized jewelry. Reign brands have been featured in Women’s Wear Daily. Reign Sapphire (OTCQB: RGNP) sells branded, custom and fine jewelry direct to consumers. This just happens to be the fastest growing segment within the personal accessories industry – expecting 3 percent growth between 2015 and 2016. RGNP’s goal is to add alternative choice in the engagement and wedding industry from the traditional diamond, as well as offer more viable luxury options for the millennial consumers. RGNP has now added the Coordinates Collection. The Company believes a portion of this market, as documented by IDEX Online Research, will embrace Coordinates’ concept of fixing the time and place of life’s most precious memories into jewelry wedding bands and bridal party gifts as thousands have already with their non-bridal collections since 2014. RGNP’s Coordinates Collection was launched in 2014. Sales grew in 12 months from 300 mil to 3,250 mil. The company is hoping to replicate this success in the bridal segment. RGNP’s Bridal Collection includes engraved wedding bands and bridal party gifts, such as pendants, cufflinks, and bracelets all fixing in time the joyful occasion shared with family and friends. RGNP’s Bridal collection has already received attention with articles in Huffington Post and SweetVioletBride.com, and the Company will continue to rely on a combination of five marketing channels to optimize customer acquisition and drive sales: social media, influencers, digital advertising, affiliate marketing, and email. ~ Joseph Segelman, Reign CEO. Founded on the concept of focusing in on a singular gemstone, Reign Sapphires highlights the intrinsic luxury that this gemstone evokes. With shades ranging from deep royals to slate blues, the stones are versatile in nature. 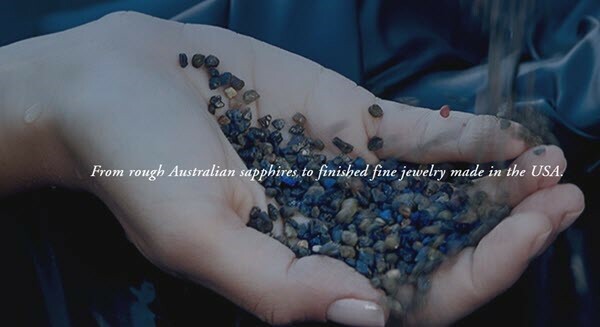 Reign Sapphires are guaranteed natural, guaranteed Australian, mined in an environmentally friendly manner, ethically processed with jewelry manufactured in the USA. The history of sapphire gems in Australia stretches back over 150 years. One of the first reports is from 1851 when sapphire was recovered during gold mining on the Cudgegong and Macquarie rivers in New South Wales. In 1854, sapphire was reported in the New England area of New South Wales, and in 1875, Sapphire was discovered in Retreat Creek, Central Queensland. Numerous small deposits have been found up and down Eastern Australia. Reign Sapphire Corp (OTC QB: RGNP) may not be ready to take on Tiffany’s and Zales, but they are establishing themselves in a much-needed niche and earning publicity with their recent moves. RGNP is still on the radar and may end up becoming a sparkling gem. DISCLAIMER: By Section 17(b) of the Securities Act of 1933, you are hereby advised that SGN Media Group, Inc. is receiving a fee of two thousand five hundred dollars in monies for a one-day period, from Reign Brands Inc. for distribution of this email and other advertising and consulting services. If we have been engaged by a third person (not the issuer), you should assume that such third person who engaged us in connection with this profile owns shares of the company AND may sell such shares in the public market. The sale of such shares may negatively impact the market price of the shares for the profiled company. We have not determined if the statements and opinions of the message are accurate, correct or truthful. The profiles we publish are compiled from publicly available information, which includes, but are not limited to, no cost online research, magazines, newspapers, reports filed with the SEC or information furnished to OTC Markets, and press releases. Because virtually all information relied upon by us in preparing an Issuer profile comes from a public source that has been made public directly from the Issuer, the information is not confirmed by a second source. Please note previous compensation was received: On June 21, 2017, and in March 2017, the combined total is two thousand seven hundred and fifty dollars in monies from Reign Brands Inc both times for one-day distribution of email and other advertising and consulting services which occurred March and June 2017. Have you watched Golf on TV and wondered how the courses keep track of everything moving on the course and broadcast it in real-time? How do they have eyes everywhere? That answer is simple as 1 Small High-Tech Company offers a Solution to Golf Courses which allow for remote management never witnessed before. And this one microcap is now blossoming. Does your portfolio need a boost with a proven winner? If so, this stock is right up your alley. DSG Global Inc (DSGT) is one of the new breed of software-as-a-service (SaaS) companies that are dominating the information technology industry. DSGT provides electronic tracking systems and fleet management solutions – a market projected to reach $35 billion by 2019 – and companies are using DSGT’s patented technology to reduce costs, increase safety and enhance customer satisfaction significantly. Software-as-a-service (SaaS) is a software delivery method that is completely changing the way software is delivered and used. Residing in “the cloud,” with SaaS you are no longer tied to a desktop or laptop and can access all the programs you use from any Internet-connected device, like smartphones and tablets. DSGT has primarily focused on the multibillion-dollar golf industry where golf course operators manage their fleet of golf carts, turf equipment, and utility vehicles remotely using DSGT’s SaaS technology. 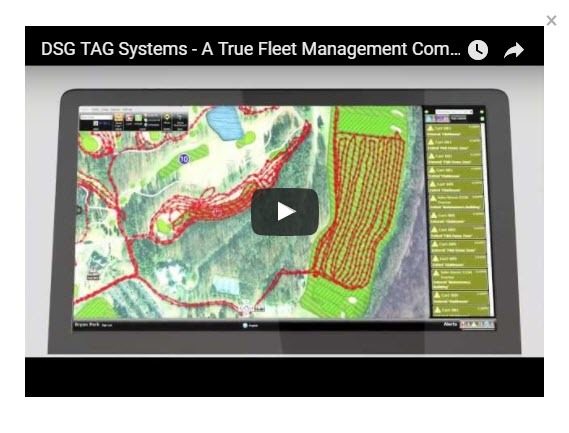 DSGT is now a leader in the category of Fleet Management in the golf industry, and to date, their technology is used on over 10,000 vehicles on 250 courses worldwide. DSGT is experiencing a Massive Response to its GPS Tag system for Golf Fleet Management and is seeing a tremendous surge in Q1 orders for their proprietary Raptor Speed Rider. The Raptor is a unique three-wheeled solo-rider vehicle. The surging demand for DSGT’s product and the company’s multiple revenue streams has allowed DSGT to grow quickly and secure steady revenue. Check out the video here and see how this works! 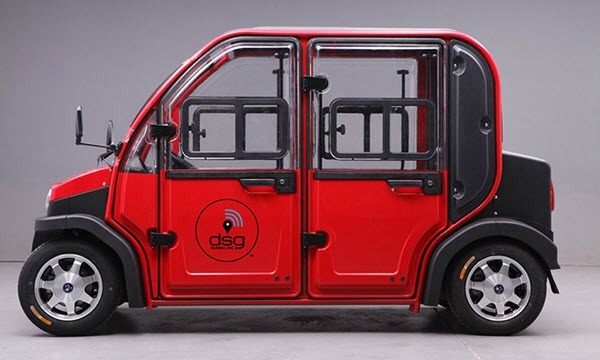 Golf – The golf market has over $2 billion in opportunity, and DSGT is the current market leader stemming from key relationships with golf cart manufacturers. DSGT is continuing its rapid global expansion in 2017 with its third installation on the exotic Pacific Island of Guam. In addition to the core Golf related business, DSGT is aggressively expanding into other markets. Agriculture – Nearly six billion cases of fresh produce are shipped across the United States each year. Starting in August 2015, it will all need to be tracked and monitored every step of the way, from field to market, thanks to the Food Safety Modernization Act, a sweeping reform that creates accountability by increasing traceability. Commercial Fleet Deployment – The fleet management market is expected to grow from $12.06 billion in 2014 to $35.35 billion by 2019. While GPS tracking is now the norm; DSGT goes beyond, tracking everything from mileage, vehicle condition, current speed and time spent idling. The company’s technology is already installed on fleets ranging from garbage trucks to cement mixers, throughout the United States and Canada. An additional lucrative revenue stream is the untapped digital out-of-home (DOOH) advertisements that are placed on the in-vehicle electronic devices. These can be designed as stand-alone ads or can be programmed to sync with mobile ads on individual users’ smartphones and tablets. The ad industry publication Adweek says, “Clearly, the intersection of DOOH and smartphones is at a tipping point.” With DSGT’s geo-fencing technology, device users can be fed ads that are specifically targeted to their high-value audience. In exchange for running ads on the devices, customers can both share the revenue and lower their costs for using DSGT’s products. The model is similar to Facebook and Google, who allow the use of their software for free because the sites are ad-supported. DSGT projects that every installation will generate $1,000 to $1,500 in advertising revenue annually for each installed unit or an average of $75,000+ per golf course. DSGT uses this revenue not only to increase their bottom line but as a way to lower costs to their customers as well. And More… DSGT has only scratched the surface of viable markets where their award winning technology could be deployed. DSGT is being led into the future with management that are serial entrepreneurs with decades of experience in technology, advertising, sales, and software. DSGT’s stock is still relatively unknown to the investing world. DSG Global is trading at a $7.0 M Market Cap and yet has announced some luxurious contracts with very prestigious names. Do you think share prices will remain this cheap when Wall Street figures out the secret? DSGT is definitely one stock worth keeping on your radar. DISCLAIMER: By Section 17(b) of the Securities Act of 1933, you are at this moment advised that SGN Media Group, Inc. has received a fee of one thousand five hundred dollars in monies from Thunderfirm, LLC for distribution of this email and other advertising and consulting services. We have been engaged by a third person (not the issuer); accordingly, you should assume that such third person who engaged us in connection with this profile owns shares of the company AND may sell such shares in the public market. The sale of such shares may negatively impact the market price of the shares for the profiled company. We have not determined if the statements and opinions of the message are accurate, correct or truthful. The profiles we publish are compiled from publicly available information, which includes, but are not limited to, no cost online research, magazines, newspapers, reports filed with the SEC or information furnished to OTC Markets, and press releases. Because virtually all information relied upon by us in preparing an Issuer profile comes from a public source that has been made public directly from the Issuer, the information is not confirmed by a second source. Emails received by you are not a solicitation or recommendation to acquire securities of the advertised company. An offer to buy or sell securities can be made only by a disclosure document that complies with applicable securities laws and only in the States or other jurisdictions in which the securities are eligible for sale. Emails distributed through disseminated emails are not disclosure documents. If you are considering purchasing any securities of an advertised company, you should read and review, if and to the extent available, any information concerning a marketed company available at the websites of the U.S. Securities and Exchange Commission (the “SEC”) at www.sec.gov ; the Financial Industry Regulatory Authority (the “FINRA”) at www.FINRA.org and your State Securities Administrator. We also strongly recommend that you read the SEC advisory to investors concerning Internet Stock Fraud at www.sec.gov/consumer/cyberfr.htm , as well as related information published by the FINRA on how to invest carefully. You are responsible for verifying all claims and conducting your due diligence. Did you ever drink Monster Energy or Red Bull before? If so, this stock is right up your alley. Beverages are a multi-billion dollar beverage industry, and a huge demographic that consumes them daily are children and pre-teens.Fernhill Beverage, Inc. (Symbol: FHBC) is catering an overlooked and underserved niche market: the child and pre-teen market. Fernhill Beverage, Inc. (Symbol: FHBC) serves a segment of the market which large beverage companies have chiefly ignored – the youngest of the consumers. There is greater profit getting the child market to purchase adult marketed products. Fernhill Beverage, Inc. is concentrating on capturing the transitioning market with fun products that appeal to youth and have ingredients that appeal to adults. FHBC has a flagship drink called Roadkill. FHBC packages Roadkill in a 12oz. Slim bottle that fits smaller hands perfectly with a label that is bright and colorful and shows cartoon animals that have lost a battle with vehicles. 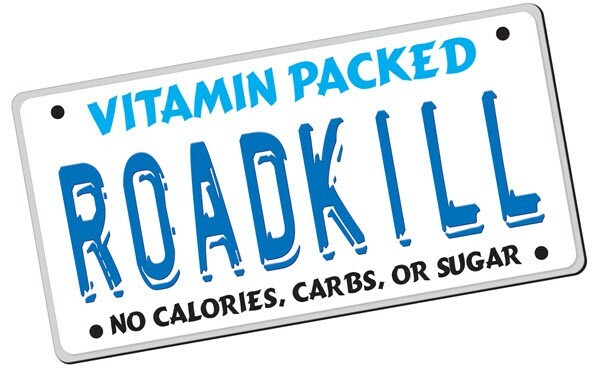 FHBC also created Roadkill XL which is a branch line of the existing Vitamin Packed Roadkill which is targeted toward the youth market of consumers. FHBC is in the process of developing other products aimed at the teen and pre-adult market to add to the product lines and to take advantage of new and existing distribution channels. FHBC put out some HUGE press last month announcing it will soon be producing Private Label products for national retailers! Each national retailer will have the opportunity to develop their own product name and characters while taking advantage of the proven bottle and flavor profile created by Fernhill Beverage. FHBC’s retailers can market their proprietary product names through their own distribution systems while allowing Fernhill Beverage to increase its revenues without jeopardizing Roadkills distribution network. Over the last six months, Fernhill Beverage has been approached by several national discounters, as well as national grocery chains, inquiring about the Roadkill and Roadkill XL brands. FHBC is currently participating in negotiations with retailers and expects to have the first of many contracts complete before the end of May 2017. 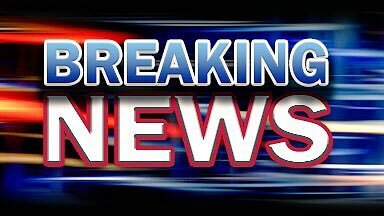 FHBC will also be expecting to add as many contracts as possible throughout the remainder of 2017! FHBC, with its brand Roadkill has been off to a fast start for 2017. The Company expects the Private Label Program to more than double Ferhills already fast-growing revenue numbers. FHBC beverages could be at retailers across the nation by the end of the year. Do you think share prices will remain at a penny when that happens? Fernhill Beverage, Inc. (Symbol: FHBC) is not going to overtake Coca-Cola or Pepsi as a top beverage producer, but if they can make progress on a few products, the grocery stores will take notice. And So will Wall Street. FHBC is one stock to keep on the radar. We will let you continue your due diligence, and we hope to get back to you with updates in the future. DISCLAIMER: By Section 17(b) of the Securities Act of 1933, you are at this moment advised that SGN Media Group, Inc. has received a fee of two thousand five hundred dollars in monies from DF Media LLC for distribution of this email and other advertising and consulting services. We have been engaged by a third person (not the issuer); accordingly, you should assume that such third person who engaged us in connection with this profile owns shares of the company AND may sell such shares in the public market. The sale of such shares may negatively impact the market price of the shares for the profiled company. We have not determined if the statements and opinions of the message are accurate, correct or truthful. The profiles we publish are compiled from publicly available information, which includes, but are not limited to, no cost online research, magazines, newspapers, reports filed with the SEC or information furnished to OTC Markets, and press releases. Because virtually all information relied upon by us in preparing an Issuer profile comes from a public source that has been made public directly from the Issuer, the information is not confirmed by a second source. Please note previous compensation was received in February 2017, of five hundred dollars in monies from DF Media LLC for distribution for the email distribution which occurred in 2017. How would you like to own a piece of a company which is a Pioneer in possibly THE hottest sector on Wall Street? Agritek Holdings, Inc (OTC QB: AGTK) is trading just under a penny, generating revenue, owns properties and trading with a market cap just over $5.0 Million? Agritek Holdings, Inc., (www.AgritekHoldings.com) considers itself as a pioneer within the medicinal marijuana space and provides innovative technology and agricultural solutions for both the medicinal and recreational cannabis industry. AGTK owns or manages a property in Colorado, Puerto Rico and Canada and has licenses with permitted facilities in California approved for cultivation as well as manufacturing capabilities through partnerships. AGTK provides innovative technology and agricultural solutions for both the medicinal and recreational cannabis industry. AGTK does not directly grow, harvest, distribute or sell cannabis or any substances that violate or contravene United States law or the Controlled Substances Act, nor does it intend to do so in the future. Creating an Extremely compelling story. Is AGTK correctly positioned in your portfolio? Three words: Location, Location, and Location. This is widely regarded as the three most important factors when buying real estate. And if this property is providing innovative technology and agricultural solutions for both the medicinal and recreational cannabis industry– it doesn’t take a Financial Analyst to realize just how valuable this asset can become. In locations which are dedicated to the science of growing Marijuana, business is booming. AGTK was chosen to manage one of the largest cultivation facilities in Puerto Rico. AGTK will receive its first rental income this month and begin funding the 25,000 sq. ft. cultivation facility in San Juan, Puerto Rico previously announced through its five (5) year operational contract. The operational contract and licensing agreement executed last month are expected to produce several hundred thousand dollars in revenue for the Company over the course of the Agreement. While sales of Marijuana seemed to be the meal ticket, the real money nowadays is in the real estate that represents the most crucial part of the cannabis business. The essential need and pent-up demand have exploded for a rapid growth of infrastructure necessary to facilitate and cultivate these lands. Who wouldn’t like to own a company with this list of assets and holdings? If you’re sitting on the sidelines, an opportunity could pass you buy! AGTK recently announced the first order for its licensed brand “MicroDose” Oral Strips for the medicinal market of California. Agritek Holdings will provide the licensing and packaging to produce the exclusive line of 10mg and 50 mg oral strips as a medicinal alternative for patients. AGTK’s “Microdose” brand will be produced and distributed through its permitted manufacturer and collective to multiple dispensaries throughout California. AGTK will receive a flat fee per package. ~Michael Friedman, Chief Executive Offices of Agritek Holdings, Inc.
AGTK holdings are almost too long to list, as the company has aggressively positioned itself to dominate this segment of the industry in the United States and abroad. DISCLAIMER: By Section 17(b) of the Securities Act of 1933, you are at this moment advised that SGN Media Group, Inc. has received a fee of two thousand dollars in monies from Agritek Holdings, Inc. for distribution of this email, and other advertising and consulting services. We have been engaged by a third person (not the issuer); accordingly, you should assume that such third person who engaged us in connection with this profile owns shares of the company AND may sell such shares in the public market. The sale of such shares may negatively impact the market price of the shares for the profiled company. We have not determined if the statements and opinions of the message are accurate, correct or truthful. The profiles we publish are compiled from publicly available information, which includes, but are not limited to, no cost online research, magazines, newspapers, reports filed with the SEC or information furnished to OTC Markets, and press releases. Because virtually all information relied upon by us in preparing an Issuer profile comes from a public source that has been made public directly from the Issuer, the information is not confirmed by a second source. As Worldwide demand increases dramatically, where can the supply be found? 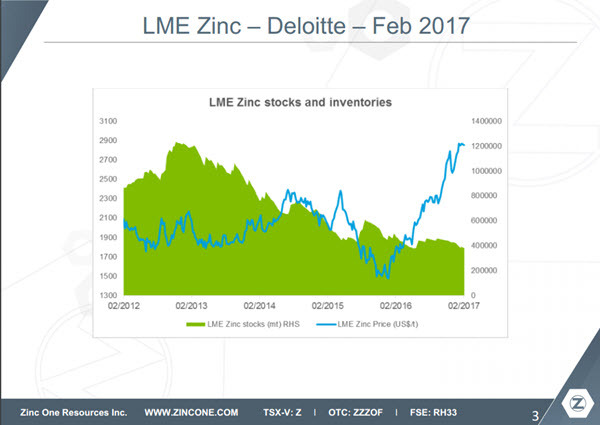 Dig on This Fact: The International Lead and Zinc Study Group released its initial 2017 report, which found the global market for refined zinc metal was in deficit over the first 11 months of last year with total reported inventories declining over the same time frame. The Zinc-Oxide global market is predicted to be worth upwards of $4.185 Billion USD by the year 2020. One small company is believed to have the highest grade Zinc mine in the world back in production – and this is only the start. One company has a plan in motion. ZZZOF is focused on the acquisition, exploration, and development of world-class zinc projects. The company believes in the current and future fundamentals of the zinc supply and demand scenario and the continued growing demand for zinc in global industrial uses. 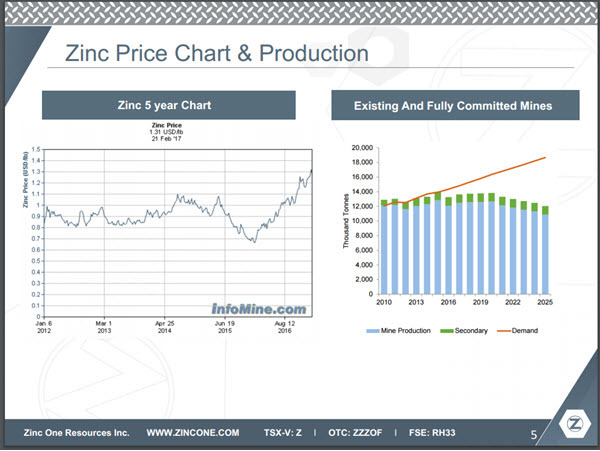 ZZZOF reviews and evaluates high-quality zinc projects at various stages of development. ZZZOF acquired all of the issued and outstanding common shares of Forrester Metals Inc. which gave them access to the Bongará zinc-oxide deposit (“Bongará Zinc Mine”) and the adjacent Charlotte Bongará zinc-oxide project (“Charlotte Bongará Project”), subject to a 2% net smelter return royalty. This is the first time that these two projects have been controlled by a single operator and thus offers a unique opportunity to delineate a substantial high-grade, zinc-oxide resource along with a 4km-long trend. ZZZOF also owns a Scotia Zinc-Silver which contains highly valuable metamorphosed massive sulfide deposit. 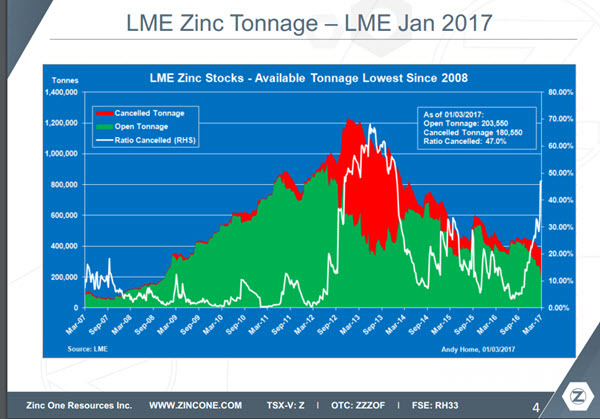 ZZZOF believes the current and future fundamentals of the zinc supply and demand scenario and the continued growing demand for zinc in global industrial uses presents a specific need for the minerals being mined. ZZZOF has some of the most accomplished and well-connected industry professionals and believes the combination of aggressive, committed, experienced management acquiring solid world class and prospective assets backed by a comprehensive marketing and financial plan and PR team is a recipe for success. Bongara’s grade is in the highest percentile bracket and on the surface. THIS IS A RARE SITUATION. Zinc One is on target to meet their updated resource estimates by the year end 2017. As Phase 2 drill program is being permitted, up to 300 drill hole platforms can be built. It’s anticipated that this will bring upwards of 90% recovery of minerals in the ground over the production goal of 30-36 months. Don’t believe us? Check out the photos here. Zinc One recently received financing to develop the operational mines and reach current targets. Zinc One Resources Inc. (OTC: ZZZOF) has received TSX Venture Exchange approval of its acquisition of all of the issued and outstanding common shares of Forrester (the “Transaction”) and has closed its previously announced private placement financing of $10,000,000 (the “Private Placement Financing”). Zinc One’s transaction with Forrester is based on a positive outlook for the zinc markets and attractiveness of the high grade past producing zinc assets contained in the Forrester portfolio. ZZZOF is not just building a mine, they’re also building some momentum. This opportunity could provide DEEP Profits for those who ‘dig in’ right away. Don’t wait another minute. It’s time to get started and dive right in. We are continuing our due diligence and will check back with you as soon as we have some updates. DISCLAIMER: By Section 17(b) of the Securities Act of 1933, you are at this moment advised that SGN Media Group, Inc. has received a fee of three thousand dollars in monies from SIERRA PUBLISHING INC a media buyer on behalf of Geodesic Solutions.for distribution of this email and other advertising and consulting services. We have been engaged by a third person (not the issuer); accordingly, you should assume that such third person who engaged us in connection with this profile owns shares of the company AND may sell such shares in the public market. The sale of such shares may negatively impact the market price of the shares for the profiled company. We have not determined if the statements and opinions of the message are accurate, correct or truthful. The profiles we publish are compiled from publicly available information, which includes, but are not limited to, no cost online research, magazines, newspapers, reports filed with the SEC or information furnished to OTC Markets, and press releases. Because virtually all information relied upon by us in preparing an Issuer profile comes from a public source that has been made public directly from the Issuer, the information is not confirmed by a second source. Can NightFood’s Midnite treat, curb your hunger? Snack on This Fact: The Total US snack market is approximate $120 billion, and 44% of that occurs in the evening or late night, representing a total consumer spend of over $1 billion weekly on nighttime snacks. Snacking dynamics also continue to change. Consumer choices for size and channel have evolved, innovation has become more targeted, and variety and children are having a huge impact on snacking choices. One company has come up with a potential solution. NGTF intends to drive revenue growth while developing relationships directly with customers through its online presence. This can be beneficial in many ways, including when testing and introducing new innovations, flavors, and snack formats. As part of their overall online scaling strategy, the NightFood will launch an updated website, grow Amazon, and identify and engage new market segments online. NGTF recently completed all requirements and elevated its status to the respected OTQ QB – an exchange dedicated to the transparent and fully compliant companies. Information Resources, Inc. (IRI), a leading consumer packaged goods research firm, has predicted that online sales of snacks will see substantial growth in the next five years. They expect E-Commerce to comprise 5.5% of total snack sales by 2022, which would represent an increase of 588% over current levels. Larry Levin, IRI’s Executive Vice President of Innovations, has stated that consumers love small brands that make their lives better. We will let you do your due diligence, and we will get back to you with updates in the shortly, and have an awesome trading day. DISCLAIMER: By Section 17(b) of the Securities Act of 1933, you are at this moment advised that SGN Media Group, Inc. has received a fee of four thousand five hundred and fifty dollars in monies from Mantle Media LLC for distribution of this email and other advertising and consulting services. We have been engaged by a third person (not the issuer); accordingly, you should assume that such third person who engaged us in connection with this profile owns shares of the company AND may sell such shares in the public market. The sale of such shares may negatively impact the market price of the shares for the profiled company. We have not determined if the statements and opinions of the message are accurate, correct or truthful. The profiles we publish are compiled from publicly available information, which includes, but are not limited to, no cost online research, magazines, newspapers, reports filed with the SEC or information furnished to OTC Markets, and press releases. Because virtually all information relied upon by us in preparing an Issuer profile comes from a public source that has been made public directly from the Issuer, the information is not confirmed by a second source.